“You’re looking different! Browner, shirt open – not like a school teacher!” the host beamed. I wasn’t sure what she meant by her last, and I didn’t feel changed as compared to a few days earlier, but she was probably right. I am more relaxed. A week in relative seclusion, in relation to cities and tourists, is just what the doctor ordered. I set it up so that I would not leave this beach or this hostel for the duration. The hostel itself was happy to oblige, providing two meals per day (included in the cost), relatively comfortable accommodations in a large private room with ensuite bathroom, and offering a four-minute walk to the beach below the deck where I spend quite a lot of my time writing and reading in the shade. If you want an analogy to get a feel for this hostel’s modus operendi, think summer camp for adults. On the beach, too. On the first night, I was gladdened to discover dinner is served to all guests at once. Perhaps thirty of us sat at a long table and communed sociably – Germans, Swiss, a married couple from Bordeaux, an Albanian, a Romanian, a few Americans, and of course, loads of Aussies. Forced into close contact, we asked: Where are you from? Where are you headed? Did you care for Rome? For Athens? For Norway? For Thailand? How did you grow up? Do you like Ricky Gervais’ comedy? What were you taught in school about the First World War? It always holds my attention to learn of all that I have in common with people hailing from parts around the globe – and to note slight differences as well. The conversation begins as we await sunset as large, small, and coupled groups of travelers, and dinner begins after that sunset. This means that we eat well after 9pm, and the socializing continues until well after midnight. Sometimes, travelers in groups stick together, which is disappointing, because they sometimes cling tightly to their friends and are not as open and curious as those traveling alone, as is the case for me. 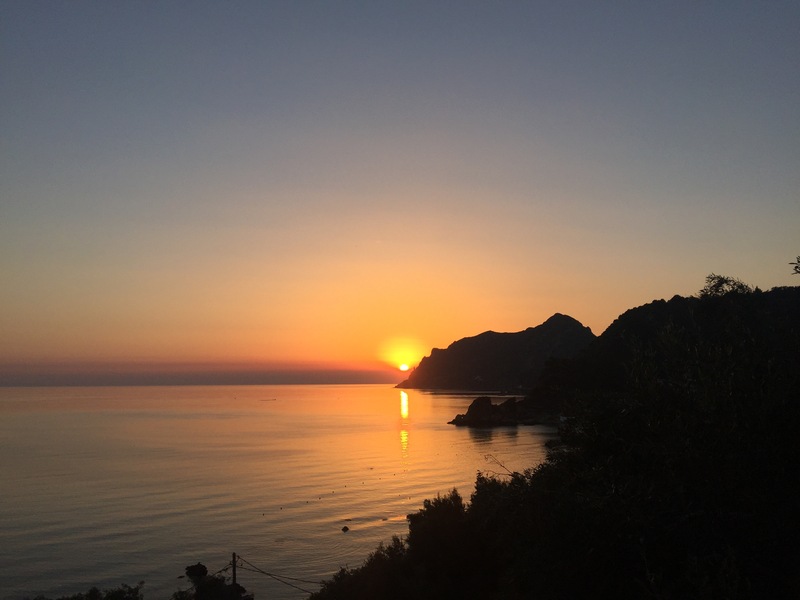 Mostly, though, the visitors to the west coast of Corfu want to hang out with people they’ve not yet met, which is good for me in limited doses. If you want to picture the space, here, I’ll offer a bit in the way of physical description. The tile deck where I work through most of each day stands three stories above ground level, is well shaded, and is built into the side of a somewhat steep hill covered in greenery. Leaves – including palms – and stalks, brambles, and red-tile roofs stand between this spot and the sandy shore of crystalline Adriatic waters, but they do not inhibit the view. The water is as clear here as it was in Santorini, and both are as clear as any I’ve seen in the Caribbean, my gold standard for beautiful ocean water. The shallows extend for hundreds of feet, as the sandbar bottom is undisturbed by strong current. It’s protected by jutting peninsular cove edges to the north and south. Pelekas Beach, it’s called. To our immediate north are the lively but mass-appealing resorts, and I’m glad at night when I don’t have to attempt sleep any closer than I am to their pulsing nightclubs. So I arrived Saturday and I’ll leave on Friday afternoon. I’ve got my daily routine down to a happy progression from a late morning breakfast at 10:30 through writing and reading until four or five in the afternoon, swimming until 6 or 7, and cleaning up and siesta-ing until sunset around 9. And then, the dinner and cross-cultural dialogues. It’s a lovely existence here on Corfu. I’d stay for a month, never leave the beach, and be completely satisfied so long as I continue writing and reading. As always, you can track the summer’s adventure on the main page for 2017 travels. Thanks for visiting. This entry was posted in Travelogue, Travelogue 2017, Travels and tagged backpacking, beaches, corfu, Culture, europe, Europe Trip, european travel, greece, hostel, hostel culture, meeting new people, pelekas beach, reading, relaxation, Slow Travel, travel, traveling, travelogue, travels, writing. Bookmark the permalink.